The paper proposes a reflection on the Greek concept of epieikeia, traditionally translated with equity, fairness or, in some particular contexts, leniency. The aim is to show that this concept allows us to focus on some important questions in the contemporary philosophical debate such as the question concerning the relationship between a general rule and a particular case, or the question about the problematic relationship between law and justice. The first step is a reconstruction of the meaning of the concept in the pre-Aristotelian tradition. The second part of the article focuses on epieikeia in Aristotelian thought, taking into account not only the systematic treatment but also the non-technical contexts. In this way, we can pursue a twofold aim: 1. to show the substantial continuity between Aristotle and the earlier tradition; 2. to show the internal coherence of the Aristotelian notion. Thanks to this reading, we can conclude that for Aristotle epieikeia is a complex mix of intellectual, moral and relational qualities. The last part of the paper is devoted to an example from Sophocles’ Antigone. More precisely, we focus on a minor character of the tragedy, Haemon, as a good example of epieikes in the sense described above. In this paper we examine again, after many others, the meaning of a key-word in the ethico-political greek thought : epieikes, epieikeia. Philosophical, legal aspects are now well investigated, but there is still food for thought about rhetorical values of the term. We remind first the enlightening role of a well known episode of Homer’s Iliad (XXIII, 362 sq.). We then show how this episode supports Francesca Piazza’s overview : the originality of epieikeia lies in its paradoxical nature, combining a sort of violation of the law with kindness. Its legitimacy comes only from the adaptation of the orator to the circumstance and to the audience. We finally examine a passage of the Rhetoric to Alexander and analyze the link between epieikeia and eikos (likelihood, acceptability) and sumpheron (common interest). After giving an explanation of Aristotle’s “technical” account of the virtue of epieikeia (“equity”) in Aristotle, various seeming difficulties in Piazza’s account are examined. The first involves Aristotle’s conjecture that the “technical” use of the term epieikes preceded the extended account: it is argued that this seems both antecedently more likely and is not inconsistent with the evidence from authors prior to Aristotle, including Homer. Other difficulties involve the Nicomachean Ethics itself, such as that that work gives no evidence of an original, extended meaning of the term. Moreover, Aristotle seems oblivious to any connotation of epieikes other than what it gets through its connection with dikaion (justice). The famous Rule of Lesbos comparison is examined and argued to lend no support to Piazza’s thesis. 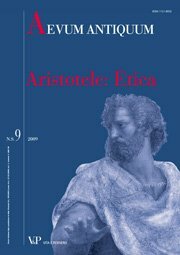 Finally, it is argued that Aristotle’s characterization of a person with epieikeia, as someone who is disposed to accept less (elattōtikos), can also be seen not to support to Piazza’s thesis, once it is realized that that term occurs in a passage in which Aristotle is giving a definition of epieikeia strictly analogous to his earlier definition of dikaiosunē. One of the main questions concerning the new Sappho is whether or not it is complete. Scholars choose one side or the other: the twelve lines of the “New Sappho” are a complete poem, or the poem continues, as it appears to do in the Oxford papyrus (POxy 1787). The binarism, i.e., of fragment and whole, that frames the discussion should itself be discussed. It has a discernible history (§1), which culminates in the mid-twentieth century with the advent of literary theory and a new conception of literature (§2). At that time, along with many changes that took place outside the field of Classics, within this field came “oral theory.” One of its implications was that the communication of archaic poetry was principally in performance. In the perspective of performance, with its various possibilities of adaptive reuse of the same poetic materials, the binarism is difficult to maintain (§3). Reuse continues in writing (§§4-5). Some consequences for the understanding of the “New Sappho” are considered in the penultimate section of this paper (§6). Finally, a distinction between fragment and part is proposed (§7). The Author reconsiders some controversial problems of staging raised by the end of Aristophanes’ Knights (ll. 1316-1408): [I] at 1326-1328 the change of scene from Demos’ house to the propuvlaia of the ancient Athens could be verbally suggested by stage directions internal to the text rather than actually carried out through some theatre device like the ekkyklema; [II] at 1331 it is reasonable to assume that Demos appeared really rejuvenated, his actor wearing a new mask, despite Edmunds and MacDowell’s objections; [III] at 1384-1386 nothing in the text suggests that the pais enorkes was visible on stage; [IV] there are good reasons to suppose that at 1389ff. the thirty-year Spondai were represented by one mute alone; [V] at the end of the play the Paphlagonian may have first appeared between 1407 and 1408, probably carried by one or more mute slaves. The article belongs to a broader project of a wide ranging reconsideration of the Pre-Socratic philosopher Diogenes of Apollonia. We challenge here Diels' view according to which Diogenes acts in the frame of Aristophanes' Clouds as a kind of a ghost thinker, hidden in the shadow of "Socrates"' character. Such a view, which is usually accepted, comes out to misrepresent Diogenes as a thinker, putting him in the worse possible light in the eyes of scholars in history of philosophy. For our sake, we focus on the water-crescent passage, probably the best supposed argument in favour of Diels' claim. We thus contrast "Socrates" ' alleged lächerliche Theorie, as Diels calls it, with Diogenes' fragments (collected by Laks 1983, 2008). In the whole, we find much more differences than similarities. This is hardly a surprising. In spite of his prominent role in Aristotle's corpus, Diogenes is never mentioned in Athens' fifth century literature, and it is even not sure that he could have been a significant target there. We thus confirm Kahn's 1997 assessment: "the influence of Diogenes on Athenian thought of the fifth century seems to be a figment of modern scholarship without basis in the text". The diversity of the extant novels and their different provenance and dating make it difficult and irresponsible to reach a simple conclusion about the readership of all of them. This paper explores the encounter of an anonymous narrator and Clitophon with which Achilles Tatius opens up his Leucippe and Clitophon, a (fictional) internal audience, focusing on the three roles played by the narrator (storyteller, inducer of the main narrative and listener to Clitophon’s long account) and compares them with what we know about the readership of the genre. The first narrator presents himself as a limited pepaideumenos, similar to an average reader, more interested in enjoying a good fictional narrative than in analysing it philosophically, though there are enough learned cues in his intervention to satisfy a reader who is looking for an intellectual past-time.